I HAVE LEFT H*R WIKI AND MOVED ON TO YOUTUBE, IT HURTS ME TO GO. BYE FOREVER! KID This user is 12 years old. SUB This user contributes to Subtitles. This user's favorite character is Strong Bad AKA-Professor Tor Coolguy. This user's second favorite character is The Cheat. This user's third favorite character is Trogdor. This user's favorite toon is Happy Trogday. This user owns a Strong Bad hoodie. Hello I'm Austio888888 or just Austio for short. So check out my Userboxes to see more info on me. I've been here awhile and know a lot about H*R Wiki. 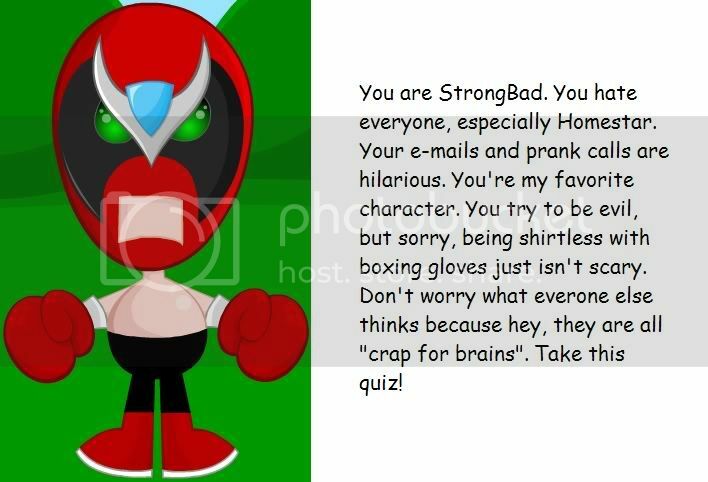 So if you have any questions or just want to say something to me go here.Also I love Strong Bad because of his hilarious attitude. I believe I came across homestarrunner.com when a young friend of mine came over with some funny dvds he called them. Those dvd's were Everything Else 1 and all four sbemail dvds. After watching First Time Here? I wondered if the website actually existed and wouldn't you know it did. Then, after watching every episode at least twice I looked on wikipedia and found HR Wiki thus bringing me here. I've had many other usernames on a lot of different websites those names are. So if you see any of these names on any websites It's probably me. I havn't been to neopets, runescape, or newgrounds since the beginning of July 206, but neopets was about a year before that. awhile ago my user name used to be Flamer8965 and I just recently changed it to Austio888888 because I just found out flamer means gay. I took an H*R personality test and below are the results, but some of it's not true (example: I don't think everyone is "crap for brains"). The quiz I took is right here. And when you take the test it will show a different picture I just edited the image to make it work on the wiki. Check out the email I sent Strong Bad this week. What is the most advanced piece of technology Pom Pom has because I always see him with some kind of electronic device. This page was last modified on 25 December 2007, at 22:34.